Legal action for a swimming pool accident won't be your top priority, but a drowning lawyer can help you decide whether it is the right thing to do. Most of our clients are reluctant to hire an attorney. They've never sued anyone before, and they're not the type of person to file a lawsuit. And that's okay. They never asked to be put in the position they find themselves in and certainly didn't want to be there. But they don't know what else to do. They've experienced devastating loss and have no closure. But most of our clients are also people who strongly believe in personal responsibility and accountability and want to make sure what they have been through never happens to anyone else. And they have been faced with an unspeakable tragedy that not only ripped a hole in their lives, but now they have to pay the hospital bills, funeral expenses, and other costs associated with the tragedy. Drowning is the leading cause of death for young children. As drowning death attorneys, we believe that 100% of drowning deaths are preventable, whether it's a swimming pool accident, or the drowning occurs while boating, at an amusement park, in a lake, or out at sea. A swimming pool attorney is going to gather the facts, compare them to local ordinances and Nevada common law and let you know if you have a case. For example, the Southern Nevada Pool Code requires that pools and spas be completely enclosed by access barriers that are at least five feet high, with no more than four inches gap at the bottom or more than four inches between vertical railings. If the drowning occurred at a water park, your drowning death attorney is going to analyze the case as a premises liability case, which includes an analysis of whether the water park owners were using good judgment when it came to safety at their park, including the features of the park, the number of lifeguards they hire and have on duty, the type of people they hire as lifeguards, the training they provide the lifeguards, and whether they enforce the rules they have for their lifeguards. Only a drowning death attorney familiar with the laws and ordinances in Nevada can give you the best advice when it comes to a swimming pool accident or other drowning accident. 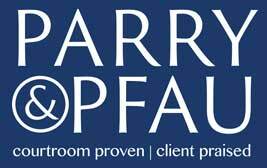 Call the swimming pool attorneys at Parry & Pfau to sit down with a caring and down-to-earth attorney who will help you navigate the legal complexities associated with this difficult time in your life.